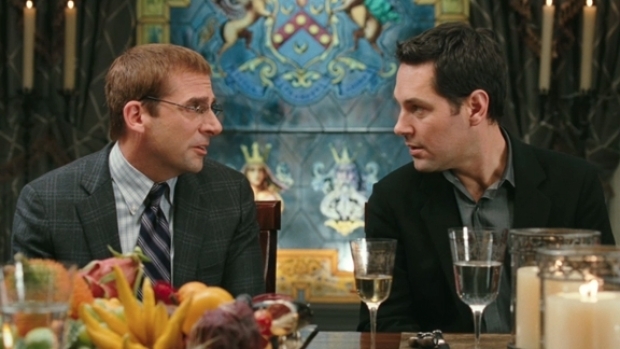 "Dinner for Schmucks," a surprisingly sweet and often understated comedy starring Steve Carell, is arguably the best film ever made with a collection of dead mice at its emotional core. Between the lyrics and mice, we already know a great deal about Carell's character Barry Speck, even before we meet him. And as the film progresses, the mice will come into play again and again as they reveal more about Barry. 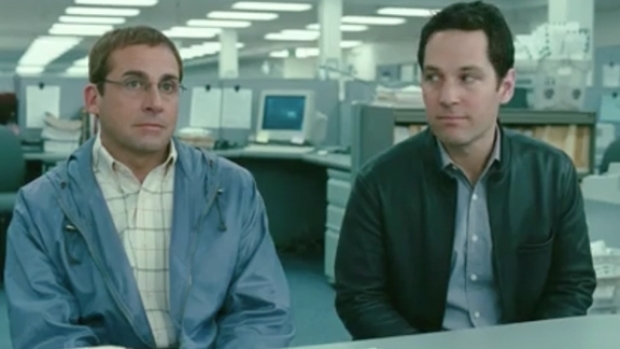 When we do meet Barry, he's face down in the street, having just been hit by a Porsche driven by Tim (Paul Rudd), a corporate climber, who coincidentally has just been told that a corner office is his if he brings the biggest idiot he can find to his boss' house for dinner that Saturday. Like manna from heaven, Barry has fallen into Tim's lap. Rather than being angry about getting hit, Barry's thrilled to have been hit by such a nice car and begins offering money to Tim to make the whole thing go away. Soon, a dinner invitation is extended and before Tim knows it, Barry has crawled into every corner of his life, making hash of everything in his path. Carell shows admirable restraint as Barry, letting the wardrobe, dialogue and mice do most of the work for him. It would be easy to "go full retard," in the words of Kirk Lazarus. But Carell, holds back, making his character far more believable (not "believable," just "more believable") and sympathetic. And of course Rudd plays the beleaguered square surrounded by morons as well as anyone. Like Carell, he holds back just enough -- never getting too angry at Barry. But director Jay Roach, the man who gave us "Meet the Parents" and "Meet the Fockers," loves to go broad, and that's when his film gets in trouble. On more than one occasion the film that it grinds to a halt, taking the air out of the film each time. The film gets a great deal of help from a supporting cast loaded with talented comedians in most every role: Kristen Schaal as Tim's assistant; Larry Wilmore and Ron Livingston as higher-ups; Jemaine Clement as the artist trying to steal Tim's girlfriend; Lucy Punch as Darla, one of Tim's former conquests; and Zach Galifianakis as Barry's colleague at the IRS, a self-anointed mind control expert who also gets invited to the dinner. Unfortunately, the film, which comes in at 114 minutes could've easily been 15 to 20 minutes shorter, and the plot goes completely off the rails toward the end of the dinner and worse still, they overplay the mice, tacking on another five minutes to and ending that's already run too long. If you want to get the most out of "Dinner for Schmucks," and there's plenty of good in there, just head for the exits as soon as the trophy is awarded to the biggest idiot. You save yourself about 10 minutes and a fair amount of disappointment.